A highly enjoyable trip to Ireland's southern capital, Cork, visiting the world renowned Blarney Stone and the Queenstown Story at Cóbh, on Cork Harbour, famous as the Titanic's last port of call. Sit back and enjoy your comfortable train journey at speeds of up to 100 mph as your train glides through the heart of Ireland - a countryside littered with castles! Check-in for 07:00 departure from Dublin Heuston Station. Your departure station, Dublin Heuston, was opened in 1844 as the headquarters of the Great Southern & Western Railway and is now the official principal station of Iarnród Éireann – Ireland’s national railway company. As your train departs, we travel in a south westerly direction, passing Inchicore, railway engineering works and then some of Dublin’s western suburbs – soon we are in the lush fertile countryside of County Kildare, Ireland’s Kentucky. Look out for the many stud farms near the track. The train passes through the town of Newbridge, home to the famous Newbridge Silverware. We now enter the Curragh of Kildare, which soon comes into view on both sides of the line. The Curragh (prenounced: Curra) is famous for its racecourse, home of the Irish Derby. At this time of the morning you are likely to see some of Ireland's finest bloodstock being put through their paces. The Curragh is also the headquarters of the Irish army and their buildings can be seen in the distance to the east. We pass the town of Kildare, and the Church of Ireland (Protestant) cathedral of St. Brigid’s – completed in 1223 – can be clearly seen to the south (left hand side when facing direction of travel). We cross the River Barrow at Monesterevin and enter Co. Laois. Our train journey makes a stop at Portlaoise (prenounced: Port Leesh-eh). Departing Portlaoise, we soon enter Co. Tipperary and pass the town of Templemore. Shortly after we pass Loughmoe Castle which can be clearly seen on the southern side of the train, built in the 15th century, the Purcell family lived there until 1760. The next stop is at the town of Thurles. At our next stop – Limerick Junction –a number of Railtours Ireland clients will be leaving the train for the Cliffs of Moher tour. Please remain on the train for the Cork, Blarney Castle and Cobh Heritage Day Tour! Our final stop before Cork is at the town of Mallow. Arrive into Cork Kent Station for 09:35, we transfer to our Railtours Ireland tour coach through Cork City to Blarney Village and historic Blarney Castle and Gardens, built in 1446 by Dermot Mc Carthy. You will have time to kiss the famous stone, which is said to bestow the gift of eternal eloquence on those lucky enough to do so. There is also time for shopping and lunch at Blarney and we recommend that you have lunch there, as this will be the only opportunity during the day to have a substantial meal. 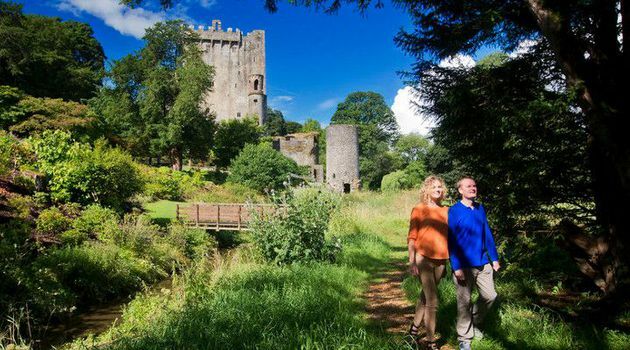 Depart Blarney Castle for Cóbh, via the city centre and a short city tour. On arrival at Cóbh we will visit St Colman’s Cathedral. We will then proceed down along the sea front passing the former White Star Line offices en route to the beautifully restored Victorian railway station/transatlantic terminal. This is now the Cóbh Heritage Centre, home to the Queenstown Story. The centre also houses much information about the Great Famine and subsequent Irish Emigration; 3 million Irish people emigrated from Cóbh, (principally to the United States) including Annie Moore, whose statue is located in front of the heritage centre. Depart Cóbh by train to return to Dublin. Returning to Dublin Heuston Station at 20:00hrs. Departures: Customer Service Desk at Heuston Station where our Check-In representative will be in their yellow jacket!